The Leftist world is aflutter. George Bush spoke recently, and they considered it a slam against President Trump. George Bush was a disaster as president. I have and will credit him for protecting the nation during the time of Clinton-created radical Islamic crisis. However, he shepherded the economy into the tank. Again, I blame Bill Clinton for creating the mess that has cost America trillions, fighting endless wars. Nevertheless, Bush still needed to rein in the budget issues. Further, his “compassionate Conservatisim” feels like a bad joke. You’d never guess that the Left HATED Bush. Now they sing the man’s praises. 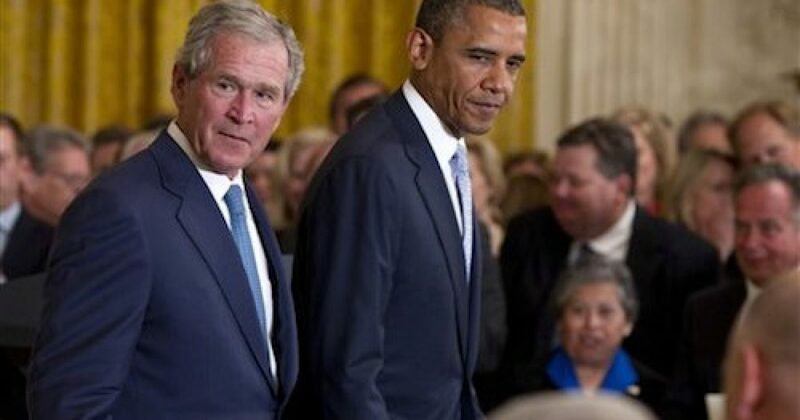 It could be because Bush mimics the Left in his disdain for President Trump and Trump supporters. 1/20 “Do you have blacks, too?” he asked Brazil’s Pres. 2/20 “I know how hard it is for you to put food on your family.” – New Hampshire, January 27, 2000. 3/20 “Rarely is the question asked: Is our children learning?” – Florence, South Carolina, January 11, 2000. 5/20 “Oh, no, we’re not going to have any casualties.” – discussing the Iraq war w/ Pat Robertson in 2003. 6/20 “I promise you I will listen to what has been said here, even though I wasn’t here.” – at the President’s Economic Forum in Waco Texas. 8/20 “I know the human being and fish can coexist peacefully.” –Saginaw, Michigan, September 29, 2000. 11/20 “I just want you to know that, when we talk about war, we’re really talking about peace.” – Washington, D.C. June 18, 2002. 13/20 “See, in my line of work you gotta keep repeating things over & over & over again for the truth to sink in to catapult the propaganda. 14/20 “You teach a child to read, and he or her will be able to pass a literacy test.” – Townsend, Tennessee, February 21, 2001. 15/20 “I would say the best moment of all was when I caught a 7.5 pound Largemouth Bass in my lake” – on his best moment in the White House. 16/20 “You work three jobs? Uniquely American, isn’t it? I mean, that is fantastic that you’re doing that.” – to a divorced mother of three. 19/20 “You know, one of the hardest parts of my job is to connect Iraq to the war on terror.” – interview w/ Katie Couric, September 6 2006. 20/20 “I’ll be long gone before some smart person ever figures out what happened inside this Oval Office.” – Washington, D.C., May 12, 2008. Bush doesn’t like President Trump. Because the president made Jeb Bush look like a clown. So Bush the Elder veils his comments on Trump, not having the balls to call the man out by name. And yet, less than 2 months into the Trump presidency, George W. Bush undermines President Trump’s fight with fake news outlets. Apparently, “remedial” presidency is over and Bush is free to criticize the man who wears “big boy” pants? Yes, and we watched 8 years of corrosion, under the man Bush said nothing about. How many journalists did Obama prosecute, and Bush was so quiet you could hear a church mouse pee on cotton? As The Black Sphere chronicled recently, Obama prosecuted more journalists than all presidents COMBINED! Guess who’s winning in the battle against the media? And against the Democrats, the RINO establishment, Hollyweird, and all other “progressives”.